When I realised that we would be staying quite close to Ironbridge during our recent visit to England and Wales that went on our list of places to see. I’ve often seen the bridge on TV and it always looks beautiful. 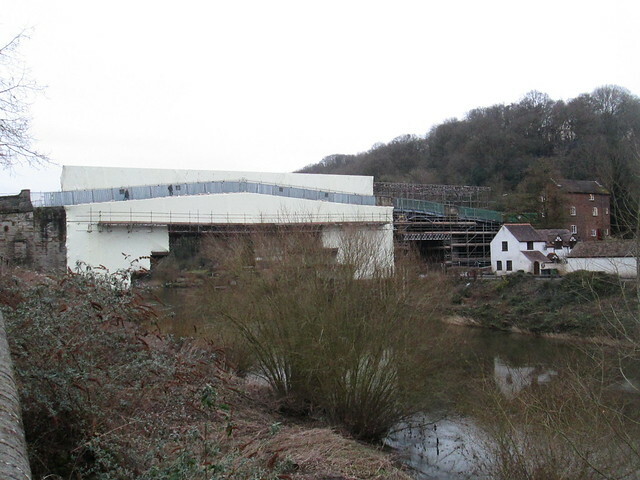 We drove into the small town and managed to park quite close to the shops (it was a Sunday) but we had only walked a few yards before we realised that the big plastic structure spanning the river was the actual bridge, swathed in scaffolding and plastic. What a disappointment, but not totally unexpected as we have a history of inadvertently visiting iconic locations when they’re being refurbished, including Chatsworth, the entire front of which was hidden. Anyway, we walked across the iron bridge as it’s not actually closed off, in fact it was very busy. Peering down at the River Severn was a strange experience. Any photographs I’ve seen of the bridge show a beautiful reflection of it in the water, but the river wasn’t looking its best. Mind you, having said that I can actually see reflections of some buildings in that photo, despite the sludginess of the water, so maybe it’s always like that. I love rivers and bridges but I’m beginning to wonder if it’s just Scottish rivers that I love. They’re always lovely and clean and they rush and tumble towards their destination – sea or loch, in a mad dash to get there and making a joyous sound. I don’t know if the area surrounding the River Severn had had heavy rain and storms just before we went there, maybe the character of that river’s water is always murky and slow moving, it looked like a brown sludge, with strange circular swirls on the surface. Colour wise it resembled a river of melted Galaxy chocolate, like something out of Charlie and the Chocolate factory, but it was somehow diabolically dangerous looking too. Anyway, our trip there wasn’t a complete dead loss as despite it being a Sunday there were quite a lot of shops open, and one of them was a good secondhand bookshop. That was where I got the two Agatha Christie paperbacks I blogged about earlier. On the way out of the shop I caught a glimpse of a book called The Story of Scotland by F. Fraser Darling and realised that I already had one in this particular book series, they were published by William Collins in 1941, 1942 and 1943. They only have 47 pages in them but they’re really nicely illustrated with interesting prints and drawings. I also bought British Ports and Harbours by Leo Walmsley, I love its cover design. English Villages by Edmund Blunden is the book that I already had at home. These books are really lovely and it amazes me that they only cost me £3 each. It seems to be the price that booksellers ask for them no matter where you are in Britain, they’re underrated I reckon, but maybe I shouldn’t say that!